I spend most of the winter shivering in New England despite numerous layers of silk, fleece, and wool. One of the few consolations that the season offers is the opportunity—often numerous opportunities—to photograph snow. Although driving in snow is wretched, seeing it is glorious. However, for years, my snow shots were disappointing. I would try to capture a brilliant snowy scene and wind up with an image that appeared dingy or slightly blue. Luckily, the cure was simple. I had forgotten that cameras are designed to expose for a nice, even medium grey. Grey, not white. So snow throws off the camera’s metering system, which tries to make the snow a nice shade of grey. If you are using a camera with a snow setting, use it. If you are using a camera without one, use exposure compensation to add one to one-and-a-half stops in the plus direction. If you are using a manual camera, do one of two things. Either use a spot meter to measure the actual light on a bright spot in the snow or else open the aperture one or more stops beyond what your averaging internal meter suggests. Try shooting when the sun is low in the sky. That way, the sun will cast shadows on the surface, which will indicate texture. If you shoot with the sun high overhead, you will probably wind up with blown-out areas. If you can include something with a spot of color, even better. 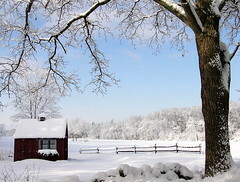 The color will help viewers appreciate the whiteness of the snow. A word of caution—be sure you protect your camera, especially if it is digital! If heavy wet snow is falling, keep your camera covered to prevent water from getting inside and damaging the circuits. You can stick it inside your jacket or inside a plastic covering. Also, do not carry an ice-cold camera directly into a heated house. Moisture from the warm air will condense on the camera, internally as well as externally. Warm up the camera gradually by leaving it inside a sealed plastic bag for a few hours in a cool spot by a door or window. Then remove it from the bag and bring it inside.